On November 10, the Los Angeles County Board of Supervisors voted unanimously to support increased diversity in both programming and management level staffing at LA County arts institutions. 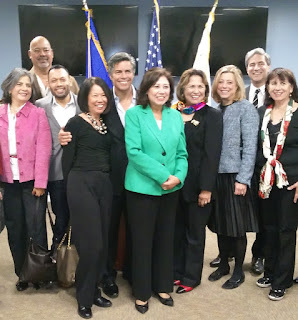 A motion by Supervisor Hilda L. Solis, will require the County Arts Commission to establish an advisory group of diverse arts leaders who will work with arts institutions to develop recommendations for ways to enhance the participation and leadership of individuals from underrepresented communities in the arts. A recent national study of diversity in American Art Museums released by the Mellon Foundation found that minorities are significantly underrepresented in top positions among museum leaders, only four percent are African American and just three percent are Hispanic. Further, the study found that minorities have no significant pipeline for leadership positions. A contingent of multi-ethnic and cross-disciplinary artists and arts leaders representing arts organizations from across the greater Los Angeles County region attended the Tuesday morning Board of Supervisors meeting to voice their support for the initiative and encourage Supervisors to approve the motion. Among them were actor Esai Morales, radio broadcaster Josefa Salinas. Los Angeles County Museum of Art (LACMA) President/CEO Michael Govan, African American Museum Program Manager/Curator Elise Woodson, Executive Director of the Robey Theatre Company Ben Guillory and Helen Hernandez, Executive Director of the IMAGEN Foundation. “I’ve served on boards in both Washington and New York. I also know how important it is that arts institutions look like the world [around them]. And believe me, LA has already been a leader,” said Moore, who performed as a dancer at American Ballet Theater long before becoming the dance company's top executive. After 11 years at the helm of New York's internationally acclaimed performing arts powerhouse, her arrival in Los Angeles was greeted by great fanfare and expectation. By far the largest single recipient of the annual Los Angeles County budgetary outlay for the arts, the Music Center received approximately $24 million for operating expenses during the 2015 fiscal year. The Music Center operates the Walt Disney Concert Hall, the Dorothy Chandler Pavilion, Mark Taper Forum and Ahmanson Theater, as well as The Music Center Plaza and the newly opened Grand Park as part of its performing arts complex. It also serves as home to Center Theatre Group, LA Opera, LA Phil and Los Angeles Master Chorale, the four resident companies which lease space from the Music Center. The motion, according to press materials from District 1 staff, directs the Arts Commission to establish a broad-based advisory task force, receive input from around the County, and identify philanthropic and nonprofit partners in moving forward with its Final Report, which is due in about nine months. The report is expected to offer specific proposals—based on community input, arts leadership and audience surveys, for example, that will lead to more diverse arts organization boards, staff, audiences, and programming at appropriate institutions and organizations. LACMA’s Govan suggested that it was time to change the long held perception among entrenched, often defensive leaders in the arts, politics and academia, that diversity efforts are impositions mandated from outside by strong-arm, knee-jerk partisans of the politically correct set rather than a pragmatic path to sustainability. “Diversity has often been seen as something to contend with” said Govan. He is among the arts leaders who know that developing long-term support for their institutions depends on their ability to convert audiences into sustaining members. Increasingly, those potential members will come from communities that have a broader range of cultural references. He looked forward, he said, to being part of a movement to help art leaders understand that a focus on diversity is ultimately beneficial to their respective institutions from a practical economic perspective as well as a programmatic one. Film and TV star Esai Morales affirmed those sentiments. “It’s a hot button topic. But diversity, the word… it means to engage in the enfranchisement of people… and because it is all about business… to grow the market,” he said. The actor, who went from a role as a juvenile delinquent in a film called Bad Boys opposite Sean Penn to playing a Mexican-American U.S. President in HBO’s comedy series The Brink, took advantage of the opportunity to “accidentally” refer to District 2 Supervisor as “Mr. Ridley-Scott.” He was rewarded by a roomful of spontaneous laughter which erupted suddenly upon his dead-pan delivery of what seemed like an honest mistake that was quickly corrected. “Children from every part of our community not only need access to a robust arts education, but also need a robust pipeline for entering these jobs. We hope that this report will provide recommendations to achieve this end,” Supervisor Solis said.